Are you in a hurry to eat? These days most people are. Here are three healthy suggestions for topping your linguine. 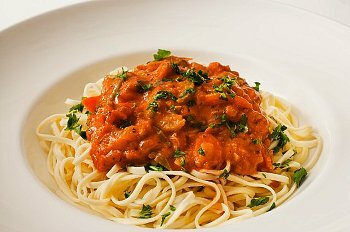 Italian Style Raw Tomato Sauce: Place very ripe tomatoes in a blender or food processor. Add fresh oregano, basil, and salt to taste. Serve over cooked linguine. To go completely raw, pour raw tomato sauce over raw Zucchini Linguine No Grain Pasta. Italian Style Rao’s Marinara Tomato Sauce: Rao’s is a delicious imported red sauce, with no added sweeteners. Let jar stand at room temperature. Open the jar, and pour it over hot noodles. Adding room temperature sauce to hot pasta helps to cool it down, so you won’t burn your mouth. If the noodles are room temperature, then you’ll have to warm up the Rao’s, unless you prefer eating lukewarm. If you can’t find it locally, here’s a handy link to Amazon, where Rao’s Marinara Sauce is sold. Asian Style Bragg’s Liquid Aminos: If you haven’t tried Bragg’s, it’s very similar to soy sauce, except it’s gluten-free, not fermented, and non GMO. This is really a dressing, rather than a sauce. But it will do nicely when you’re in a hurry to have your meal. If you can’t find it locally, here’s a handly link to Amazon, where Bragg’s Liquid Aminos is sold. Posted on September 14, 2012, in Food, Recipes and tagged Amazon, Bragg's Liquid Aminos, Linguine, pasta, quick meals, quick pasta sauces, Rao's Marinara, vegetarian cooking. Bookmark the permalink. Leave a comment.